With funding from Global Affairs Canada, there are currently hundreds of rewarding volunteer opportunities in 10 different countries! Eastern Europe and the Balkans (Ukraine, Serbia). 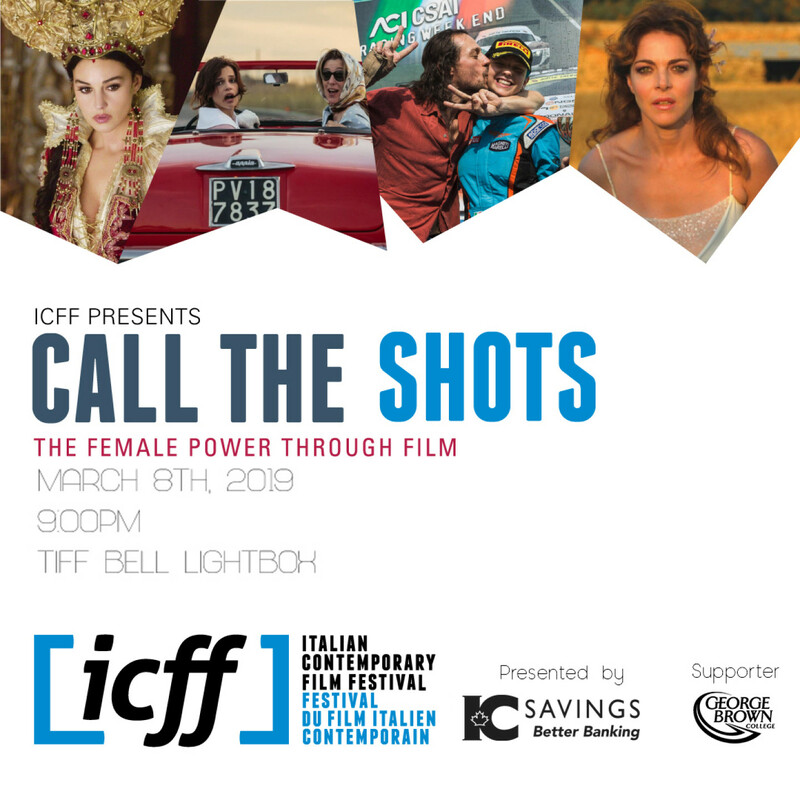 ICFF launches its annual event, Call the Shots: Female Power Through Film. March 8th, 2019, as part of the ICFF Special Programs. Serrao Soppelsa, Co-ordinator of Cultural Events. the evening from the unique perspective of women in the film industry. Capotondi, best known for her roles in Notte Prima degli Esami and Milano 2015.
colleagues, but more importantly for her child. audiences films of relevance and social conscience. The event is supported by George Brown College. For more information on the event and to purchase tickets, please visit www.icff.ca. and Delta Air Lines – the Official Airline Sponsor of the ICFF. Our client, Loblaw Companies Limited (“Loblaw”) is Canada’s food and pharmacy leader and the nation’s largest retailer. With a network of 2,500 corporate and independently-operated stores in communities across the country, it employs close to 200,000 Canadians, making it one of Canada’s largest private sector employers. Recently named as one of Canada’s Top 100 Employers (2018), Greater Toronto’s Top Employers (2018) and Canada’s Best Diversity Employers (2017), Loblaw values and respects its employees and has created an excellent environment in which to work. Loblaw continues to anticipate and deliver on customers’ needs in a rapidly evolving industry – harnessing technology and relationships to deliver new and exciting multi-channel, personalized shopping options. Given the size of Loblaw’s workforce, which spans across the country and which is largely unionized, the Labour, Employment & Human Rights legal group plays an important role in the organization providing legal and strategic support to the various business groups, including Human Resources, Labour Relations, Retail Store and Supply Chain Operations. Senior management looks to this team to provide guidance and advice related to labour strategy, dispute resolution and negotiations, attend hearings, mediations and manage employment litigation and provide training on human resources management. Reporting directly to the VP, Labour, Employment and Human Rights, Loblaw is now seeking a Legal Counsel, Labour, Employment & Human Rights, to join its head office in Brampton. The ideal candidate will have 5+ years of labour and employment experience gained with a firm and/or corporation. A deep understanding of labour issues and extensive experience of representing companies at labour arbitration hearings and mediations will be essential. Expertise across a broad range of employment and human rights matters will be key for this role. A passion for oral advocacy, excellent drafting skills and a business-oriented mindset will be required. Experience in immigration matters and AODA compliance would be an asset. The ability to be proactive, decisive, innovative and self-motivated will be important. You will also need to be a strong collaborator and communicator, able to provide practical and effective strategic advice and to build relationships with business and human resources groups across the country. If you are a constant learner determined to pursue excellence and ready to work in a fast-paced environment, then we invite you to apply. This position offers interesting and high-profile work as well as long-term career growth opportunities within the George Weston Limited group of companies. If you are interested in applying for this opportunity, please forward your CV and cover letter to Lorene Nagata or Lesa Ong of NagataConnex Executive Legal Search at info@nagataconnex.com. The Commercial List Users’ Committee (“CLUC”) is currently accepting nominations to serve a three year term beginning in Fall 2019. CLUC meets regularly to consider improvements to the organization and operation of the Commercial List and, from time to time, if/as appropriate, to make recommendations to the Regional Senior Justice and the Chief Justice in that regard. CLUC is comprised of members of the Judiciary who sit on the Commercial List from time to time, practitioners who are familiar with the operation of the Commercial List and representatives of Courts Administration from the Commercial List Office. Up to 10 positions on CLUC may be available for the coming term. Those interested in applying to sit on CLUC are encouraged to submit a written application by way of brief letter (e.g. 1-2 pages) setting out your interest, qualifications, and interaction with the Commercial List. It is not necessary to submit a CV or resume. In selecting members, the Nominations Committee and CLUC will consider applicants’ experience in matters before the Commercial List, and leadership in and contributions to the legal community. CLUC seeks to be representative of the legal profession, and to have a diversity of voices at the table. We encourage members of all equity-seeking groups, and lawyers with ten years of call or fewer, to apply. Lakehead University is conducting an extensive search for Dean of the Bora Laskin Faculty of Law, to take office by July 2019, and invites expressions of interest, applications, and nominations. Lakehead is a comprehensive university with a reputation for innovative programs and cutting-edge research that offers a variety of degree and diploma programs at the undergraduate, graduate, and doctoral levels. With campuses located in Thunder Bay and Orillia, Ontario, the University has almost 10,000 full-time equivalent students and 2,000 faculty and staff. Maclean’s 2018 University Rankings have, once again, included Lakehead among the country’s Top 10 universities in its category. In 2018, for the fourth consecutive year, Re$earch Infosource ranked Lakehead first among Canada’s undergraduate universities. Located at the head of Lake Superior, Lakehead’s Thunder Bay campus is one of the most beautiful in Canada, with many of its programs complemented by fieldwork and a focus on northern socio-economic issues. Further information is available at www.lakeheadu.ca. Located in Thunder Bay, the Bora Laskin Faculty of Law is a unique law school with a focus on Northern Ontario that graduated its first class in 2016. Its Integrated Practice Curriculum has made the Faculty the first Canadian law school to provide real world legal skills as part of the JD program, allowing graduates to be called to the bar in Ontario without needing to article. Three mandates are embraced within the Faculty’s curriculum: Aboriginal and Indigenous Law, Natural Resources and Environmental Law, and Sole/Small Town Practice with the Integrated Practice Curriculum. Committed to making a difference, providing access to justice, and leading the way for northern communities, the Faculty is home to an innovative curriculum, distinguished learner-centered legal professionals, and the opportunity to serve its community through Lakehead University Community Legal Services. Reporting to the Provost and Vice-President (Academic), the Dean, Bora Laskin Faculty of Law will be responsible for all academic, administrative, and external activities of the law school. The Dean will ideally be a legal educator and scholar with experience that is relevant to Indigenous, northern, and rural legal issues and interests, as well as familiarity with the Indigenous peoples of the region. In addition to a JD or LLB, candidates should possess a graduate level law degree, have an open and collegial style, outstanding management, communication, and interpersonal skills, a creative approach to problem solving, the ability to inspire staff, faculty, and students, and the capacity to build and sustain positive work relationships with academic and other administrative units. The ability to promote and serve as an internal and external advocate for the Faculty of Law’s three mandates and ongoing accomplishments will be essential. Lakehead University is committed to creating a diverse and inclusive environment and welcomes applications from all qualified individuals from equity seeking groups. In accordance with a key mandate of the Bora Laskin Faculty of Law, priority in hiring will be given to qualified Indigenous persons who self-identify as such in the application process. Lakehead University recognizes that the Thunder Bay campus is on the traditional land of the Fort William First Nation, signatory to the Robinson-Superior Treaty of 1850. Queen’s University invites nominations, applications, and expressions of interest for the position of Dean, Faculty of Law with the appointment ideally beginning July 2019. This is an exciting opportunity to lead a law school that is growing, innovating, and driving legal studies in new and exciting directions. Queen’s has a long-standing reputation for academic excellence, impactful research, student experience and leadership, and engaged alumni. Queen’s balances excellence in undergraduate studies with well-established and innovative graduate programs within a dynamic learning environment for more than 24,000 undergraduate and graduate students. Deeply committed to academic and research excellence, Queen’s will bolster the vibrancy of its teaching and learning with 200 new faculty over a five-year period. Queen’s University is located in the heart of scenic Kingston, midway between Montreal and Toronto, and close to Ottawa, the nation’s capital, and within a one hour driving distance of the U.S. border. Queen’s University is situated on the territory of the Haudenosaunee and Anishinaabek. For additional information about Queen’s, please visit www.queensu.ca. Queen’s Law is one of Canada’s best law schools, with an international reputation for academic leadership, excellence in research and teaching, and a strong sense of community among students, faculty, and alumni. Its faculty members are world-class researchers who remain equally committed to innovation and excellence in the classroom. Queen’s Law programs include a Juris Doctor (JD) degree that offers a variety of experiential and international learning opportunities, LLM and PhD degrees, a new online undergraduate Certificate in Law, and in 2019, a Graduate Diploma in Legal Services Management. The Faculty has 630 undergraduate and graduate students, more than 80 faculty and staff, and 6,500 accomplished and loyal alumni. Additional information about Queen’s Law is available at https://law.queensu.ca/. Reporting to the Provost and Vice-Principal (Academic), the Dean is the Faculty of Law’s senior academic officer, providing strategic direction, academic planning leadership, and administrative oversight to achieve the highest possible standards in legal education and research. The Dean will successfully manage the financial, administrative, and human resources of the Faculty, and promote and enhance the reputation and achievements of Queen’s Law both internally and externally. Committed to the success and development of students, faculty, and staff, the Dean will work collegially and collaboratively with academic, legal, alumni, and public sector partners to further enhance the stature and resources of the Faculty. The Dean will be a visionary and innovative leader with strong achievements in legal research, teaching, scholarly activities, and service, and demonstrated leadership capabilities in a university setting. Candidates will possess an open and collegial style, outstanding management, communication, and interpersonal skills, entrepreneurial abilities, and a creative approach to problem solving. The new Dean will be able to inspire faculty, staff, and students, build diverse, inclusive, and collaborative teams, and relate to a range of internal and external partners. An interest in or experience with fundraising will be an important asset in this role. The University invites applications from all qualified individuals. Queen’s is committed to employment equity and diversity in the workplace and welcomes applications from women, racialized persons/visible minorities, Indigenous peoples/Aboriginal peoples, persons with disabilities, and LGBTQ+ persons.